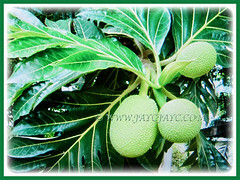 The Breadfruit is popularly grown as it is a source of staple food in many regions worldwide. It is one of the highest producing food plants in the world. A single tree can produce up to 200 or more grapefruit-sized fruits per season. 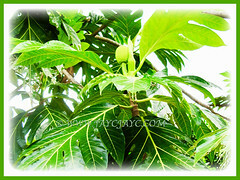 Botanical Name: Artocarpus altilis (syn. : Artocarpus communis, Artocarpus incisus). Common Names: Breadfruit, Buah Sukun in Malay. Etymology: The genus Artocarpus is derived from Greek words, artos meaning bread and karpos meaning fruit. The species epithet altilis means fat or stout in reference to its fruit. Origin: Native to tropical Southeast Asia and South Pacific extending from New Guinea through the Indo-Malayan Archipelago to Western Micronesia. It is also cultivated throughout the tropics. 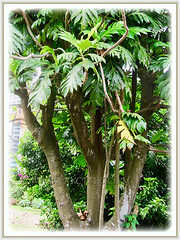 Plant type: An equatorial or tropical perennial tree with edible fruits. 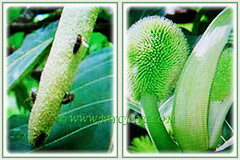 Features: Artocarpus altilis is from the genus Artocarpus that consists of about 60 species of flowering trees. However, there are numerous cultivars. A fast growing tree that reaches 26 m tall, often with a clear trunk up to 6 m, becoming 0.6-1.8 m in width and often buttressed at the base. There are many spreading branches, some thick with lateral foliage-bearing branchlets, others long and slender with foliage clustered only at their tips. The dark green and leathery leaves are held on thick and yellow petioles up to 3.8 cm long. They are ovate, 22.8-90 cm long, 20-50 cm wide, entire at the base, then more or less deeply cut into 5 to 11 pointed lobes. The large and thick leaves are dark green and glossy on the upper surface with conspicuous yellow veins. On the underside, they are dull, yellowish and coated with minute and stiff hairs. It is monoecious with male and female flowers growing on the same tree. Flowers grow on short stems from the trunks and large branches (cauliflorous). The male flowers emerge first and followed shortly afterward by the female flowers. The male heads are club-shaped, 15-25 x 3-4 cm while the female heads are globose to cylindrical, 8-10 x 5-7 cm. The compound and false fruit develops from the swollen perianth and originates from 1,500-2,000 flowers visible on the skin of the fruit as hexagon-like disks. The large fruits, measuring 10-30 cm and 9-20 cm wide, are usually round, oval or oblong and has a rough surface. Each fruit weighs between 0.25-6 kg. 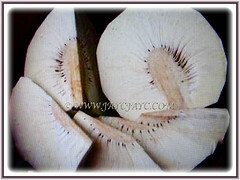 The fruits starts of green, turning yellow or yellow-brown when ripe.The flesh inside is creamy white to pale yellow. The fruit contains many rounded or obovoid seeds. Seeds are irregularly compressed, 1-3 cm long and with a pale to dark brown seed coat. 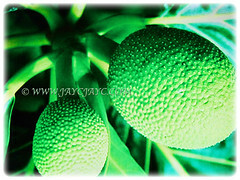 Breadfruit tree grows in both seeded and seedless forms, with the commonly marketed cultivars being seedless. Culture (Care): Artocarpus altilis or Breadfruit can be grown with a little extra care. 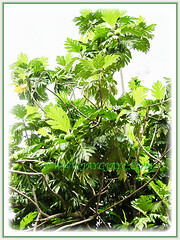 Others: Prune the Breadfruit tree annually. Nonetheless, if you prefer shorter and more bushy tree, you may start to prune sooner. This will help keep the tree in the proper shape and good harvesting height, as well as will encourage vigorous growth. Good air circulation is essential for optimal plant health. Trees should not be spaced too closely to reduce the chance of disease. Feed once monthly with a water-soluble fertiliser or time-release fertiliser. Generally free from serious pests and diseases. Nevertheless, watch out for whiteflies, soft-scales, mealybugs, snails, slugs, botrytis, mildews and soft rot. Artocarpus altilis or Breadfruit is ultra-tropical and requires a temperature range of 16–38°C. It is a tropical to sub-tropical evergreen tree that requires consistent moisture, a temperature in excess of 15.55°C and high humidity of 70-80%. It performs best in deep, fertile, humusy, well-drained soils, including sandy-alkaline ones, but has adapted to a variety of different soil types. 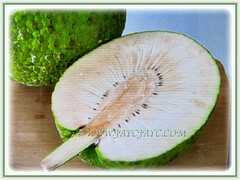 Seeded breadfruit is grown from seeds while seedless breadfruit is grown from suckers. Propagation: Easily propagated by root cuttings, root shoots or suckers. Seeds are rarely used for propagation. Usage: Artocarpus altilis or Breadfruit is primarily grown as source of staple food in many regions of the world. It is one of the highest-yielding food plants, with a single tree producing up to 200 or more fruits per season. It is excellent as a shade tree or as an ornamental tree. Both ripe and unripe fruits have culinary uses but unripe fruits are best cooked before consumption. 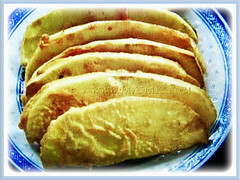 They are full of starch and may be cooked whole, stuffed with meat, coconut or fruit and stored as a fermented mash. The taste when cooked has been compared to bread or potato. The leaves can be used to feed livestock. Breadfruit contains phytochemicals having potential as an insect repellent. In addition to the fruit serving as a staple food, its light and sturdy timber has been used for outriggers, ships and houses in the tropics. All parts of the tree yield latex which is useful for boat caulking. Besides, it has medicinal uses. A decoction of the leaves to lower blood pressure and relieve asthma, ashes of burned leaves for skin infections, toasted flowers are rubbed on the gums around an aching tooth and diluted latex is taken internally to overcome diarrhea.